You may also receive the error: "sorry you are not authorized to perform that action, reason: http web server: Lotus Notes exception – entry not found in index"
1. 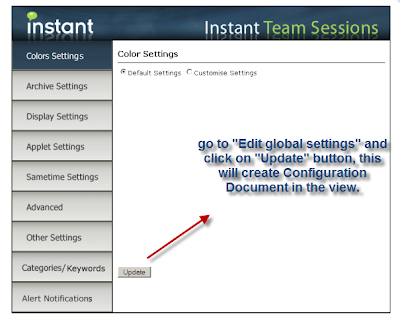 Once you set up ITS, go to "Edit global settings" link and click on the "Update" button. This is a one time activity. Once this is done, the configuration document is created. Hi, I am unable to drag and drop a conact from Communicator r2 version client to any XAML window. Any alternative or solution ?